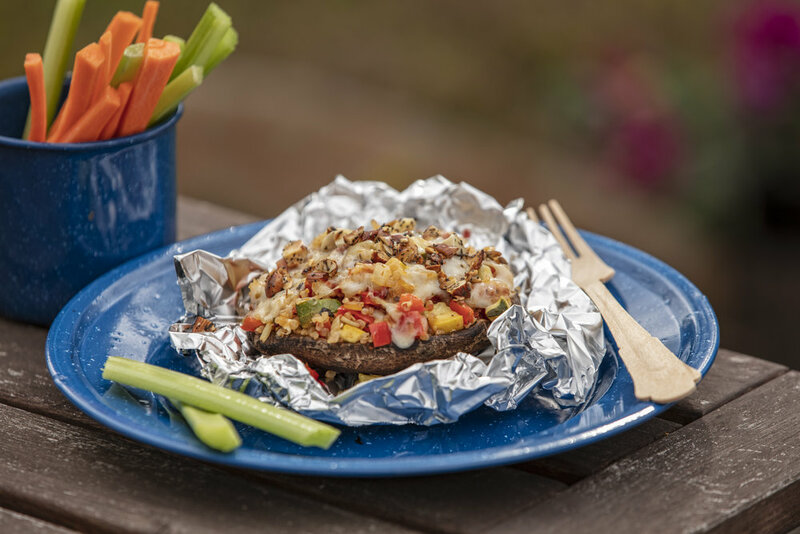 Sautéed vegetables, toasty almonds and a bit of quinoa are baked in a portobello mushroom in this meatless meal. To prepare Italian Almonds, heat oil in a small skillet over medium heat. Add almonds and seasoning and cook for 5 minutes or until toasty, stirring frequently; set aside. To prepare stuffed mushrooms, preheat oven to 400°F and line a baking sheet with foil. Scrape away black gills from mushrooms with a spoon and place rounded side down on baking sheet. Heat oil in a large skillet over medium heat. Add onion and cook for 10 minutes or until softened, stirring occasionally. Stir in zucchini and bell pepper and cook for 5 minutes more. Stir in quinoa and seasonings, then stir in 1/2 cup Italian Almonds. Pile into portobello mushrooms and top with equal amounts of cheese. Sprinkle 1 tablespoon almonds over each mushroom. Bake for 15 minutes or until mushrooms are tender, tenting with foil if tops brown too quickly. Prepare Italian Almonds and vegetable filling ahead. Stir 1/2 cup almonds into filling and store in a tightly covered container. Store remaining almonds in a small container. Store all in a cooler. Place mushrooms and shredded cheese in 2 more separate containers. Assemble and place mushrooms over a campfire, cooking for about 10 minutes. Cook on foil if necessary. Pile into portabella mushrooms and top with equal amounts of cheese. Sprinkle 1 tablespoon almonds over each mushroom.